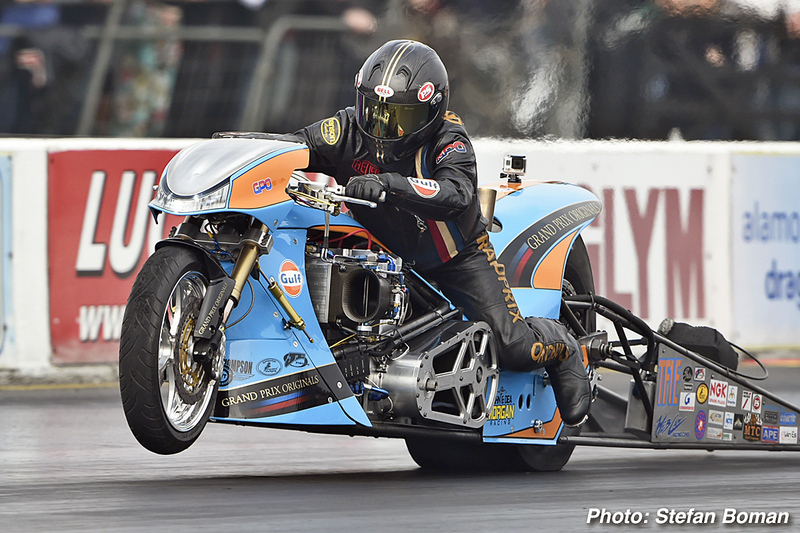 The Gulf Oil Dragracing – Grand Prix Originals continued their amazing win record in the FIM European Championship when rider Ian King clinched his 8th European Championship at his home track of Santa Pod Raceway, UK, and the team’s third in succession. The team traveled to the last round in the prestigious Championship with the knowledge that although it was mathematically possible for their great rivals and good friends Rikard Gustafsson of Sweden and Filippos Papafilippou of Greece to push them into third position that it would take a truly superhuman effort and an unnatural set of circumstances for them to lose their Championship lead. The European Finals weekend started brightly with great weather, a huge crowd with the stands and banking packed. The team got off to a great start with an off the trailer 6.1038 secs. run to put King a significant distance ahead of the rest of the field and in the number one qualifying position that remained intact into the second day of qualifying where he ran an even quicker 6.0619 secs. to consolidate top spot into race day. Expectations were high amongst fans and supporters that the team would repeat their 5 second performances on the well prepared track. 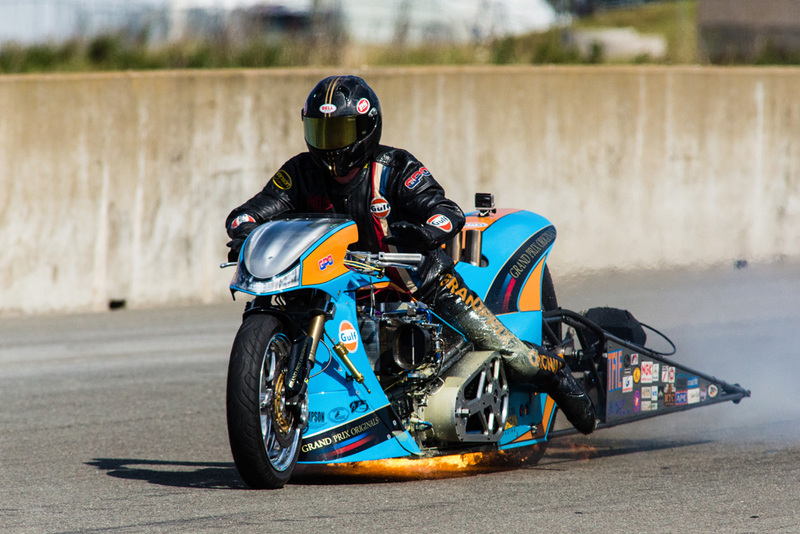 However, the team suffered a number of uncharacteristic issues for the remainder of qualifying, and a drop in oil pressure in the first round match-up with eventual finalist Otto Knebl ended in a fiery blaze after the bike broke two conrods that exited through the engine block resulting in an oil and fuel fed blaze and a series of nasty electric shocks through the handlebars as the fire burnt through the high energy ignition system. Notwithstanding the premature end to the race for the team their number one qualifying position had earned them an unassailable Championship points lead and the disappointment of the first round loss was quickly forgotten as the team celebrated their continued Championship success. 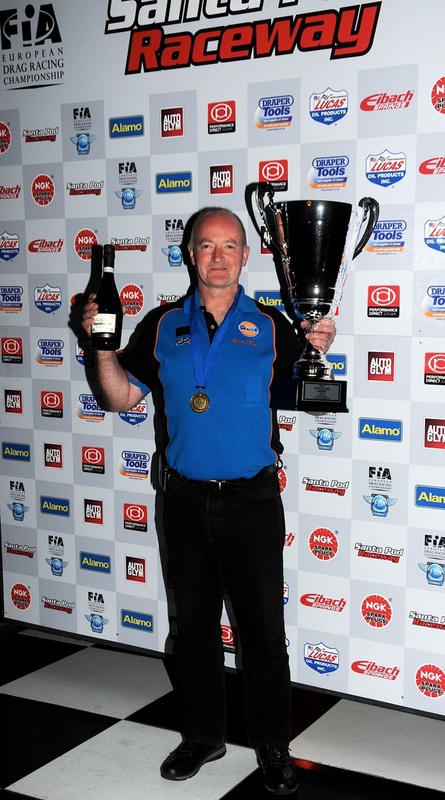 “I am honored to have had the privilege of riding the awesome Gulf Oil Dragracing machine once again this year. This has been a year of superlatives, winning the first event of the year in the US Championship, leading both the US and European Championships at the same time, running our quickest ever time of 5.8 seconds, taking the final position in the prestigious MTC Top Fuel Five Second Club and now to win our 8th European Championship title is testament to our fantastic race team of Michael Beaumont, Marius van der Zijden, Martin Brookman, Nick Pepper and Debbie King, and the direct support of Gulf Oil International and Grand Prix Originals. Despite the set up problems we suffered this weekend the machine has been unbelievably reliable, the quality of the world leading parts supplied by our fantastic team of product support and the help of our service supporters has been immense. A special mention must go to John and Dea Morgan, our primary US race partners along with Mike and Sandy Marsh who made our US trip such a success and Ivan Sansom and Rose Hughes who are not only great photojournalists but also good friends and invaluable sponsors. SPIES HECKER – the world’s leading supplier of paint for car, commercial and industrial finishing.